"The Purple People Eater" is a novelty song that was on billboard charts. The song was about a strange monster (described as a "one-eyed, one-horned flying purple people eater") descends to Earth because it wants to be in a rock 'n' roll band. 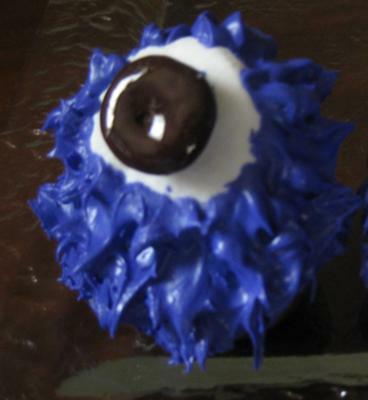 I love the legend of the purple people eater and I decided to come up with a cute recipe project for my family to do involving the purple people eater. I was very pleased with the results. These have been a fun addition to our Halloween baking! PREHEAT oven to 350º F degrees (180º C). Grease 24 mini-muffin cups. Place one square of cookie dough into each cup. BAKE for 15 to 17 minutes or until golden brown. Cool completely in pan on wire rack. With tip of butter knife, remove cookie cups from muffin pan. Arrange on serving platter. Trim a corner from one short end of each marshmallow. Attach the marshmallows, cut side down, on top of the cookie cups with a dot of frosting. Spoon 2 tablespoons of vanilla frosting into a small resealable bag; set aside. Tint the remaining vanilla frosting purple with the food coloring. Spoon the purple frosting into a resealable 2-quart freezer bag. Snip a very small corner (1/8 inch) from bag. Pipe dots of frosting along the outer edge of the cookie cups with a pipe-stop-and-pull action to create spikes of frosting. Continue piping all over the cookie cups to completely cover all but the flat side of the marshmallow. Repeat with the remaining cookie cups and frosting. Snip a very small corner (1/16 inch) from the bag with the vanilla frosting. Pipe a dot of vanilla frosting in the center of each marshmallow and attach the chocolate-coated mint. Pipe a small line to add as the sparkle in the eye.